By the end of this fiscal year, the U.S. will have spent $1.3 trillion dollars over the past decade prosecuting the wars in Iraq and Afghanistan. I propose we wrap things up now and employ that Navy SEAL-6 squad instead. Seems to me you can spend billions and billions going after the tail of the monster, or a couple hundred million and go for a double-tap to the head of the beast. No, really. What if instead of sending hundreds of thousands of U.S. troops, we had just used good intelligence and Navy sharp-shooters eight years ago to take out Saddam Hussein? What if instead of fighting what may become a protracted conflict in Libya, we send Muammar Ghadafi a little note hinting that some Navy SEALS may be paying him a visit shortly. Might he immediately negotiate for exile in Sharm el Sheikh where he and Hosni Mubarak could have adjoining estates? I’m only half-kidding. It seems to me there are a lot of different ways to get to the same end. The surgical strike approach gets there faster and a hell of a lot cheaper in both treasure and human lives. Getting the leader doesn’t ensure victory but I suspect it speeds up the process. But you can’t go around the world assassinating people, you argue? Excuse me, but did you see what we just did with Osama bin Laden? Did we ask Pakistan’s permission? Did we ask them to come along? No, we didn’t. That would have been pretty darned silly, considering the laser-sharp quality of Pakistani intelligence which couldn’t figure out what that big million dollar mansion was with the 18-foot walls and barbed wire some 50 miles from their nation’s capital. 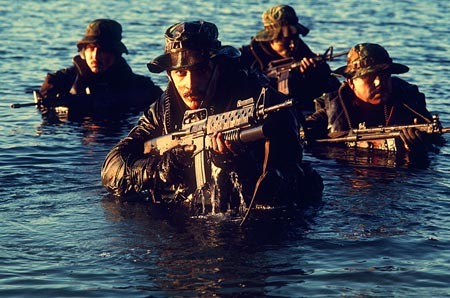 And in total seriousness, the more I learn about these Navy SEALs, the better I sleep at night. I am so glad they’re on our side. The truth of the matter is that they have been engaged in many missions in Iraq and Afghanistan. Remember the American ship captain they rescued last year from Somali pirates with pinpoint fire at a tiny target bobbing up and down in a large ocean? I believe that was the last time we know of that President Obama specifically turned to the SEALs. This all makes too much sense so we know it is never going to happen. Still, we live in hope! Don’t we?